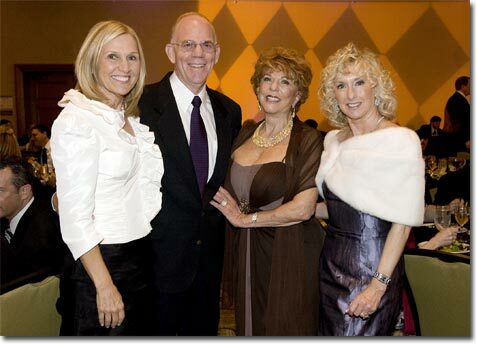 Sally Anderson, Pacific Symphony Board Chair and Event Co-chair; Richard Kaufman, Principal Pops Conductor; Jane Taylor, Event Co-chair; and Donna Schroeder, Event Co-chair. Orange County, Calif. - It looked as if Mardi Gras had come to Orange County last Saturday night—when more than 200 guests adorned in dressy attire and ornate masks gathered for Pacific Symphony’s 2010 Pops Opening Night Dinner and Masquerade Soiree to celebrate much-loved Principal Pops Conductor Richard Kaufman’s 20th anniversary! The enchanting and mysterious night-to-remember got underway with a cocktail reception, as guests entered the Westin South Coast Plaza via a red carpet, where they were greeted by brightly costumed stilt walkers, jugglers and other Commedia dell’arte performers. The multi-faceted evening continued with an elaborate dinner, followed by a masked procession to the concert hall for the Symphony’s “Three Phantoms in Concert,” led by Kaufman and featuring three extraordinary singers who played the starring role in Andrew Lloyd Weber’s Broadway hit, “The Phantom of the Opera.” Post-concert, the party continued back at the hotel, where guests danced to a live band and special guest artist Whitney Kaufman performed for the revelers. The night proved to be more than just a grand celebration, it also raised $125,000 (net) for the Symphony’s artistic and education programs. Chaired by Sally Anderson, Donna Schroeder and Jane Taylor, the soirée’s theme was influenced by a very important scene in both the musical and movie, “The Phantom of the Opera,” which takes place at a masked ball. Hidden behind a spectacular variety of masks, guests mingled and enjoyed cocktails and hors d’oeuvres, while models from the event’s retail partner St. John and costumed performers on balls and stilts roamed the room. (Ermenegildo Zegna was also a retail partner for this event.) Guests then headed into the ballroom for a special dinner created exclusively for the event by The Westin’s executive chef Hussain Zouhbi. While enjoying live music by the Joey Sellers Band, dinner was served, beginning with a roast apples-goat cheese-pecans salad—whetting appetites for the entrée duet of whole roasted beef tenderloin and jumbo shrimp. 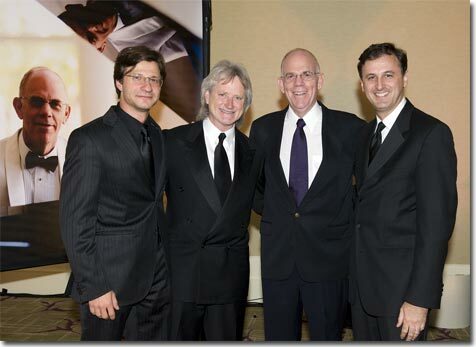 Maxim Eshkenazy, Assistant Conductor; Carl St.Clair, Music Director; Richard Kaufman, Principal Pops Conductor; and John Forsyte; Symphony President. Pacific Symphony’s Pops series is made possible by the Symphony’s official airline, American Airlines; official hotel, The Westin South Coast Plaza; official Pops radio station, K-Earth 101; and official television station, KOCE-TV.